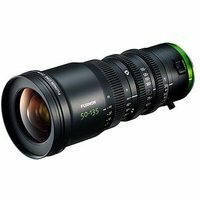 The Fujinon MK 50-135mm T2.9 is a premium quality telephoto zoom cinema lens. Featuring traditional T-stop aperture readings - 2.9 across the entire focal range  a full 200° rotation of the focus ring, and a click-free manual iris control, this lens is designed especially to meet the needs of modern filmmaking. This lens fits both full-frame and APS-C Sony E mount cameras.